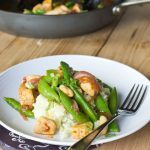 Chicken Stir Fry is a staple for a quick weeknight meal. This is super flavorful, and in ready in 20 minutes. In a small bowl combine the brown sugar, soy sauce, fish sauce, vinegar, chili garlic sauce, sesame oil and cornstarch. Stir until well combined, set aside. Heat a large skillet over high heat. Add 1 Tbls of canola oil, swirl to coat. Add chicken, and cook until browned and cooked through (about 5 minutes). Remove chicken from the pan. Add last 1 Tbls of canola oil to the pan. Add peas, and onions, stir fry until the veggies are crisp tender, about 3 minutes. Stir in the sauce mixture. Cook for a minute or two, until thickened. Add the chicken back in, tossing to coat. Serve over white rice. Sprinkle with green onions and peanuts.